During the lifetime of a locomotive, an axle generator can be replaced time and time again. Debris that chips away at, and eventually shakes the unit loose, can cause unplanned downtime and replacement costs. The ZTR Axle Gen not only has a new slim line but it allows for EIGHT individual outputs in one small but robust unit. These outputs feature selectable voltage levels and provide enhanced precision. “This Interface Module of this device not only provides power for the axle generator itself, but also takes the information the generator is communicating and produces the various speed signals for speedometers, control systems, event recorders or any other devices requiring speed information.”~ Rich Colwell, Rail Sales Director at ZTR Control Systems. The ZTR Axle Gen low profile design reduces the likelihood of damage by debris and its internal design protects it from water and oil that can get inside and freeze. This makes the ZTR Axle Gen maintenance free, while increasing the overall reliability of your locomotive. You can count on ZTR Control Systems as the Locomotive Modernization Experts to ensure your fleet is ready for the new technology developments of the future. Low profile design – ultra compact design and sloped sides for debris deflection reduces the likelihood of damage from impact. Easy to install – direct replacement for older axle generators and uses your existing driveshaft. Multiple outputs - Up to 8 available outputs to support modern locomotive requirements, including PTC systems. Field-configurable options – universally programmable PPR up to 512 and other options configurable in the field, with no software downloads needed. Low maintenance – oil free with no maintenance required. Active, self-powered technology – with a built-in power source no movement is required for activation and better accuracy results. Call 1-952-233-4340 for more information. Are you attending the 2016 ASLRRA Short Line Railroad Convention on April 3-6, 2016? 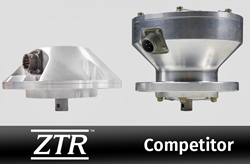 We would like to invite you to the ZTR booth # 701 for a chance to win exciting prizes including a Samsung tablet OR even the new ZTR Axle Gen.
*One prize per person. Prize options limited to availability at the time of spin. ASLRRA 2016 - April 3-6 National Harbor, Maryland. Booth #701.